Lt Gov. Gavin Newsom, the front-runner in the race for governor, concluded his seven-day bus tour of California with a get-out-the-vote rally for domestic workers in a union hall near San Diego State University. 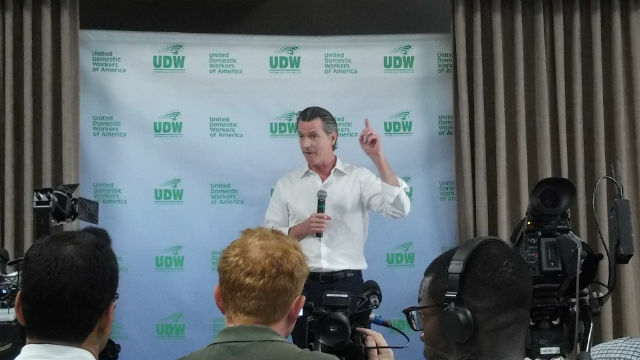 “I will have your back as the next governor of California,” Newsom told members of the United Domestic Workers of America, Local 3930. He promised the audience, which numbered a few hundred, that he would resist President Trump and work to end poverty and homelessness. He criticized Fox News for a recent program attacking California as a state whose best days are past, noting that it has the fifth largest economy in the world and is a global center of innovation. “California is where the future happens first,” he said. Newsom, who most polls credit with a wide lead ahead of the June 5 primary, began the 30-city bus tour in Sacramento last Tuesday.